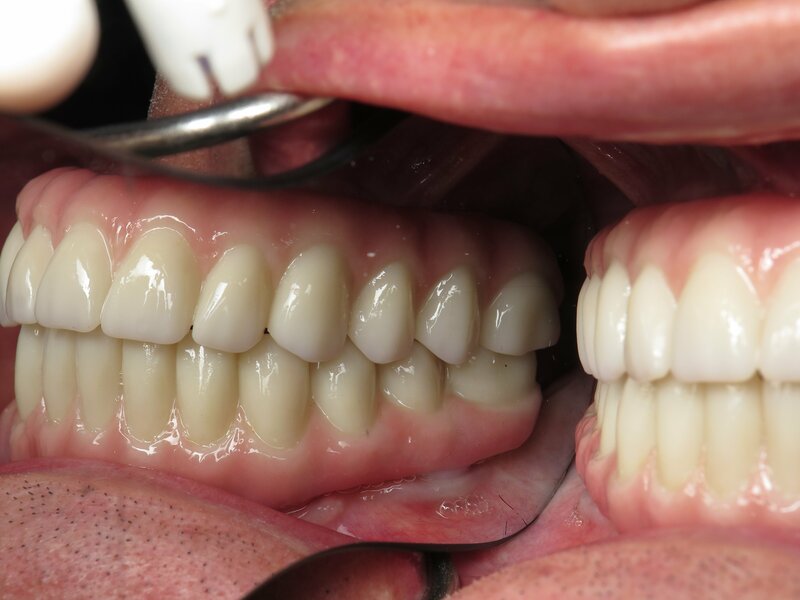 In this post I will try to detail the start to finish of full upper and lower dental implants with Prettau solid zirconia dental implant bridges. This gives a general outline for what to expect if you were to have to lose all of your teeth and replace them with full arch zirconia implant bridges. I will describe the rationale for treatment which may help those of you in similar situations. Sometimes you have to have bone graft and sometimes you do not. Sometimes the dental implants can be placed simultaneously with extractions and other times the extractions, implants and bone grafts need to be or should be done in phases. Final x-ray with upper and lower solid zirconia Bridges on 12 implants. There are 24 teeth supported by these 12 implants. What is unique about my approach is often procedure can be done in a single visit surgery without the need for “major” bone grafting such as lateral window sinus procedures or block grafting(although I routinely do these major grafts for other reasons). he plan is to harness this patient’s existing good bone and avoid the areas where the bone is deficient, thin, risky and doesn’t have a lot of density. This patient is about 55 years old and as you can see has quite a substantial dental problem. His upper teeth have a temporary bridge that is not well fabricated and was just put in so he could have “something there.” The lower front teeth are missing. The upper jaw is very small and narrow in comparison to the lower jaw which is wide. This places the patient into a reverse cross bite which must be taken into account for both the surgery and the long-term with the teeth. The mechanics of the bite can often destroy the fragile bone at the top of an implant. I cannot emphasize enough that replacing all of your teeth with dental implants is a highly complex procedure that should be unique to your situation and not just the same recipe “all on 4” for every single patient. I also believe that one implant dentist completing your treatment from start to finish has the most control of your result. It also helps to save cost as compared to this procedure being done by 2 different dentist….A surgeon and a restorative dentist. Your treatment plan and diagnosis is the most critical element which is done early in the planning phase. For this patient I need to engineer his full mouth dental implants and solid zirconia bridges to be strong at the level of the teeth and strong in the bone so that he does not get bone loss or broken teeth. This happens very commonly when these procedures are not well planned or discount parts and techniques are used. On the preoperative panoramic x-ray we can see that the patient has had a substantial amount of dental work. There is bone loss and decay on most of the remaining teeth. This patient was tired of investing thousands of dollars over the years into procedures that all failed and he did not feel that his smile was attractive. In his case, while he slept under IV moderate sedation, I extracted all of the remaining teeth and placed all the implants simultaneously. The procedure was planned by 3-D CBCT analysis which is essentially virtual computer surgery. The bone had to be leveled in some areas so that all of the implants were approximately on an even plane leaving plenty of thickness for teeth. These types of full arch solid zirconia bridges not only replace teeth but in his case were also replacing bone and gum. This is why these types of restorations look different because without replacing the bone and gum on the bridge the patient’s face would look sunken in and his speech would be improper. At no point will this patient ever be without teeth. In my practice in Burbank, California, this is unacceptable for patient to walk around without teeth although I have had a few patients that preferred to do that. On the upper jaw 6 dental implants were placed into the best possible bone. The rear most dental implants were placed at a tilt facing backwards on purpose. This will alleviate the need in this patient for right and left maxillary sinus bone grafts. The teeth can be cantilevered about 1-1/2 teeth beyond where the implants end to give this patient teeth all the way to the first molar position. This means that the 6 dental implants will support 12 teeth on the bridge. This tilted concept is not always possible and depends on where God made your sinuses and nerves. Sometimes the sinuses are too far forward for this to work. Especially on the upper jaw you want implants going as far back as possible and as many implants as possible because the bone is soft. The number of implants is critical and should never be compromised as this is the main structure that will hopefully make things last as long as possible because dental implants are not permanent!! On the lower jaw, the 6 dental implants are scattered more evenly around the jaw because this particular patient had room above the nerve on the rear molar areas. This places dental implants underneath all of the bridge without a cantilever which is a great approach. In a patient that does not have bone in the rear molar area, the implants can be more centralized towards the front middle and teeth cantilevered towards the back. In the latter scenario, you want to make sure that the implants are good and long and you have at least 5 of them. It takes 3-6 months for the implants to integrate. During that phase, I begin to prototype the patient’s mouth so that they can see feel and test drive what their new smile will look like. Adjustments will be made to the teeth and a wax pattern is fabricated. In this patient, I made conventional open tray impressions of his upper and lower jaw using a putty type of material. Sometimes the impressions can be made digitally also using the 3Shape Trios 3 scanner that I have. The impressions are then scanned in a physical and digital model is made. I then fabricate what is called a verification jig. This device verifies that your impression is accurate and your bridge *will* fit…no guesses or maybes. This is not a step that should be skipped although I find many dentists that do. This is the equivalent of the framing of a house… It needs to be perfect from the structural standpoint so that everything last a long time. Panoramic x-rays are generally taken along the way in order to verify that the custom abutments are flush to the implants. After the verification jig comes another try in to verify you like the look of everything and then we switched over to PMMA fixed temporaries. The fixed temporaries are the closest prototype to the real one. The purpose is for you to be able to test drive the real ones. It also allows me to test speech, facial aesthetics, dental aesthetics, bite, TMJ, hygeine and so much more. You will go home wearing these great looking, stong temporaries and wear them for 1-2 months generally. During this time life is good and transitioning to the final is really easy because it feels even better than the digitally fabricated and milled PMMA temporaries. The final solid zirconia Prettau dental implant bridges are delivered and generally screwed into place. The screw access holes were closed with a composite material after all of the abutments screws are tightened. It is quite the process to replace all teeth with fixed solid zirconia dental implant bridges but it is so worth it. I’m certain this is the best that dentistry has to offer as of 2016. There are many clinics that advertised discounted procedures and techniques but you need to be very careful what you may end up with. Sometimes people have problems and no dentist wants to fix them because treatment was so bad to begin with. Sadly, I see this every single week. This patient can chew whatever he wants an should not have any problem for a long time. Total treatment time for this patient was approximately 9 months from start to finish. Wasn’t sure where to post my question for this matter after you helped me with the zygomatic implants that I thought I might need. Woke up from that surgery to be told I didn’t need to do it on the maxillary (6) that I had because the healing had surpassed his expectations! Lots of prayer by many people for me :). Now I am starting the lower mandible and was wondering if it is best to go with opposing materials for top and bottom, than both being zirconia. Maxillary All-on-Six is zirconia. Any problems with that combo, or should I select Zirconia for the bottom too? Thank you for your kind words once again. Complications can and do occur. Remember that dental implants are a replacement for teeth. They are not natural teeth. I wish we could make things like nature made them but we are left making prosthetic versions of nature. Is it normal to see the abutments ever? I am in desperate need of some intervention in the mouth. I have 3 working teeth and have multiple health problems and on disability. I can’t chew much and I am in need of help. Try a local dental school…they can provide basic treatment. They would not do a fixed implant bridge in most situations. I bet this chap is over the moon!! How many years would implants like these need taking out and replacing? Also how do you clean the implants if the front is covered by artificial gum? Implants are easily cleaned with a water pick device , floss, toothbrush and little brushes that are computer designed to fit in the tiny hygiene space. The material was so smooth that it is very plaque resistant but it is important to practice excellent oral hygiene. Typically I do not remove these unless something is wrong which is very infrequent. Thank you!! If I ever need anything like this doing in years to come I’m flying from the uk to see you. I have family in marina del rey. I don’t care how much it costs. Your work speaks for itself! :0! I note that in this case there was quite a bit of false gum. This is understandable if the patient had gum loss. However, it does seem to make them more like a fixed over denture instead of a bridge. This is an excellent observation. Keep in mind that some people are missing just teeth. Some people are missing teeth and gum and some people are missing teeth, gum and bone… The trifecta. Each situation is unique. Most people have lost a significant amount of bone and require a pink portion of replacement so that the face does not cave-in in the teeth do not look overly elongated likely horse teeth. Some people need bone leveling in order to put all the implants in properly while others do not. The goal is to make the solid zirconia dental implant bridges has natural feeling as possible but of course they are different than your original teeth.